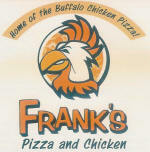 company that has been serving the very best pizza and specialty sandwiches since 1971. From our Den to Yours." "Home of the "Suicide Sub"
We Deliver within a 7 mile area!!! Evans City, Callery, Connoquenessing, Seven Fields, Myoma Road, Pinehurst, Ehrman Farms, Foxmoor & Zelienople. We cater Businesses & Parties !! Monday - Thursday 11a.m. - 10 p.m.
Sunday - 3 p.m. -9 p.m.
menu items that all Northsider's love. Wiseguys specialty hoagies and wings.